The new addition of Control capability allows you to smartly monitor your room temperatures, light timing, automation, safety control and dimming. By simply connecting the Lumatek Digital Panel (sold separately) into the TRS “Link” port on your controllable ballast. The 400 volt Lumatek Ballast run with a purpose built 400 volt lamp gives a substantial increase in crop growth by providing a better colour spectrum emitted from the lamp, providing a much plant friendlier spectral energy. 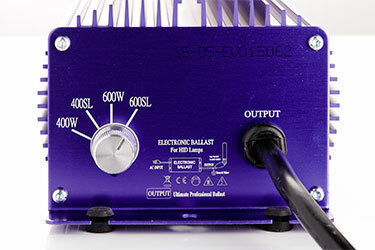 The ballast can sense which type of HPS lamp is being driven and will adjust accordingly. 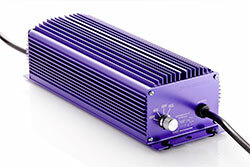 If a standard format HPS lamp is used the performance will be the same as using a standard Lumatek ballast. Using the 400 volt lamp and ballast together will see the higher performance. Completely compatible with all your usual reflectors. Under no circumstances use a 400 volt lamp in any other ballast. 5% more plant light energy than the standard ballast. 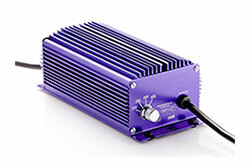 A Lumatek Digital ballast can produce up to 30% more light output than a conventional ballast. The efficient use of electricity has side effects - they run cooler. The unit doesn't require the venting fans seen on other models.ew block looks like. The efficient use of electricity and high lumen output, make Lumatek's lumen to watt ratio very high. The intelligent electronics allow either Metal Halide or High Pressure Sodium lamps to be run from the same ballast. Lamps reach full brightness in less than one minute, compared to around twenty minutes for a magnetic ballast. Very low start up current. No buzzing or vibrations during start-up or running. The ballast will cut-out if a short is detected, for ultimate safety. Super Lumen - What does it mean?? Super Lumen is like a turbo mode for your ballast. This image shows the dial on a 600 watt dimmable ballast. 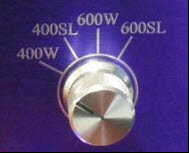 600W - 600 watt 'normal' setting. 400W - 400 watt 'normal' setting, or a further 'dimmed' 600 watt setting. The Super Lumen setting should only be used with HPS lamps. It should never be used when using Metal Halide lamps, and will cause damage to the lamp. The Super Lumen dial can be operated while the ballast is in operation, but must be left operating for 10 minutes before changing to another setting. Changing the Super Lumen setting sooner than this will result in reduced lamp life.